The study determined it costs a minimum $9,590 to educate a regular education K-12 student in Michigan. Researchers determined that funding in addition to the base cost should be provided for special education, English Language Learners, students living in poverty and Career and Technical Education. A packet of information was sent to each general election candidate to make them aware of the study and its findings. Also included in that packet is a summary of polling conducted on the concepts put forth in the SFRC adequacy study, as full implementation would require additional resources. The packet can be downloaded here. The key takeaways from the school adequacy study have been broken down into core messages and key takeaways that can help district leaders effectively share the highlights of the report with community members and local leaders. The School Finance Research Collaborative has completed Michigan’s first comprehensive school adequacy study, providing a roadmap to fixing Michigan’s broken school funding system. The nation’s top two school finance research firms determined the true cost of educating a student, informed by nearly 300 Michigan educators from across the state. The final report provides a base cost for student achievement in Michigan, with additional funding considerations for special education, English Language Learners and poverty. The study was supported by the School Finance Research Collaborative, a diverse group of business leaders and education experts, from Metro Detroit to the U.P., who agree it’s time to change the way Michigan’s schools are funded. The study proves that per-pupil funding must be increased to provide all students with a high-quality, 21st century education that addresses their wide-ranging learning needs. The study concluded that it costs a minimum $9,590 to educate a child in Michigan, regardless of location, income, learning challenges or other circumstances. Recognizing that all children are unique and many learn differently, the study calls for additional funding weights for special education, English Language Learners, Career and Technical Education and students living in poverty. The study concluded that Michigan’s school funding system also must take into account district size, districts in geographically isolated areas, and differing transportation costs. Districts and charter schools should get the same base cost for each regular education student, and the comparable wage index should be used to account for cost of living differences. Districts and charter schools in the state pension system should have those legacy costs and other costs fully funded in addition to the base cost per pupil. Further study is needed on capital needs and funding for school districts and charter schools, high-needs poverty and student transportation costs. With the true cost of educating a student in hand, Michigan policymakers can adopt a new approach that helps improve student achievement, reflects varying student needs, and prepares students for the ever-changing modern workforce. Every child learns differently, and to improve student performance we must change how we fund Michigan’s schools to address the individual needs of all students. The world has changed dramatically since Proposal A passed in 1994, including the advent of the Internet, expanded global competition and increased automation, and our school funding system must reflect those changes. Michigan ranks at the bottom in student performance nationwide, and our students will only continue to fall behind if our school funding system doesn’t address their wide-ranging needs. The base per-pupil cost to educate a regular education K-12 student in Michigan is $9,590, which does not includetransportation, food service or capital costs, and only includes pension costs at 4.6% of wages. Charter schools should have the same base per-pupil funding for a regular education student and the same adjustments to the base amount that traditional districts receive. It costs $14,155 to educate a preschool student age 3 or 4. In addition to the base per-pupil cost, a percentage of the base cost should be provided for special education, English Language Learners, students living in poverty and programs to provide Career and Technical Education. Transportation costs should be funded at $731 per rider until further study can be carried out. Because Michigan’s school district sizes vary widely and small districts lack economies of scale, district size must be taken into account, with funding increases provided for all districts under 7,500 students. 1. What is an Adequacy Study and why is it important? Adequacy studies determine the true cost of providing a quality education to all students, regardless of their income, location or other circumstances. These studies often include geographic cost differences, labor cost differences and analysis of geographic isolation, among other factors. The School Finance Research Collaborative study was done based on Michigan’s State Standards for student achievement for all students in both charter and traditional public schools. 2. Who is the School Finance Research Collaborative? The School Finance Research Collaborative is a diverse, broad-based and bipartisan group of business leaders and education experts from all corners of Michigan that formed in 2016. It’s time to change the way Michigan’s schools are funded. 3. How was the study paid for? Funding for the study came from the W.K. Kellogg, Charles Stewart Mott and Skillman foundations, as well as other nonprofits and associations. Additional funding came from more than 22 ISDs across Michigan. 4. Isn't this study just about more money? This study calls for research-based decisions as a best practice to help all Michigan students achieve and succeed. Adequacy studies have proven nationwide to be a critical first step toward any meaningful education reform that has resulted in improved student achievement. 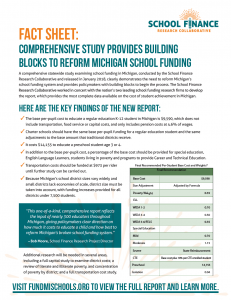 Michigan’s current school funding system is broken, and this study provides the building blocks for a new school finance formula that serves the widely varying needs of all students. 5. What were the report's key findings? Simply put, the study identified a base cost for educating a student, and also identified several factors that deserve additional funding – from special education and English Language Learners, to Career and Technical Education. The study also identified needs in related areas, like transportation and operational funding, that deserve policymakers’ attention. The study found the base cost of a regular education student is $9,590 for both traditional public schools and charter schools. That amount excludes transportation, food service and capital costs, and only includes pension costs at 4.6% of wages. This percentage of the base cost is calculated by a funding weight for each category in both traditional public schools and charter schools. 6. How should we fund special education? Mild-level severity: Students should be funded at an additional funding weight of 0.70 of the base per-pupil cost. Students are in a regular education classroom 80% of the time. Moderate-level severity: Students should be funded at an additional funding weight of 1.15 of the base per-pupil cost. Students are in a regular education classroom 40% of the time. Severe-level: The State of Michigan should reimburse 100%. Students are in the regular education classroom 20% of the time. 7. How should we fund English Language Learners? The WIDA language assessment tool should be used to determine a student’s proficiency in language. WIDA levels 1 and 2: Students should be funded at an additional 0.70% of the base per-pupil cost. WIDA levels 3 and 4: Students should be funded at an additional 0.50% of the base per-pupil cost. WIDA 5 and 6: Students should be funded at an additional 0.35% of the base per-pupil cost. 8. How do we address student poverty? Poverty students should be funded at an additional 0.35% of the base per-pupil cost. More study is needed to determine the impact of literate and illiterate poverty and concentrations of poverty across Michigan. 9. How should we fund Career and Technical Education? In addition to the base cost, an additional 10% per CTE enrolled student should be applied for the increased cost of equipment and supplies. 10. What about students in smaller districts and remote areas? Additional student funding for certain school district characteristics should be added because district expenses operate on economies of scale. Isolated school districts should receive an additional .04% of the base per-pupil cost. The state definition of an isolated district should be amended to include all areas of the state, not just the U.P. There are 196 school districts with less than 1,000 students, and 210 school districts with enrollment between 1,000 and 3,000 students. Smaller districts with fewer students incur greater charges per student as a result. The study examines how cost differentials can be applied to account for this effect on public school districts. 11. What did the research say about pre-K for 3- and 4-year-old children? The base cost for preschool is $14,155 with no additional funding weights. More intense resources are needed due to low teacher-to-student ratios. Significant returns on investment for preschool require high-quality pre-K programs. To best educate our youngest students, Michigan should make preschool for all students a goal. 12. What did the research say about student transportation? A per-rider amount of $731 should be allocated above the base per-pupil cost. An additional study is needed that designs a more specific transportation-cost formula. 13. What did the research say about school personnel wages? The study recommends using a Comparable Wage Index (CWI) for Cost of Living (COL) differences due to geographical location. 14. What was not studied by the researchers? 15. What was recommended by the researchers for additional study? Capital costs: The researchers recommend the state conduct a full capital study that examines the costs faced by districts and charters schools. Transportation: The researchers recommend additional study for the transportation needs for all districts. This study should include the needs for isolated districts, and determine if a separate funding source is needed. Poverty: The researchers recommend additional study for high-needs poverty and possible additional funding to serve those students. 16. Who did the research? This study was conducted by Augenblick, Palaich and Associates and Picus Odden & Associates, the nation’s top two school finance research firms. The research team has over 100 years of combined experience. APA has conducted this type of research in all 50 states. 17. How was the research done? The study used the Evidence Based (EB) and Professional Judgment (PJ) approaches to determine the true cost of student achievement in Michigan. The PJ approach gathers leading educators to identify human resources and operating expenses needed to meet student achievement standards. The EB approach uses academic research on student performance to identify needed resources for schools to meet state standards. Nearly 300 Michigan educators informed the study. They served on panels focused on all grade levels, preschool, special education, English Language Learners, poverty and Career and Technical Education. The study included a first-of-its kind panel on charter schools, and also examined districts of varying sizes and geographically isolated districts. The report incorporated findings of Michigan’s 2016 school funding report, which called for increasing base per-pupil funding and additional funding for at-risk students and English Language Learners. The state’s report used the Successful School District (SSD) approach, which assumes the base cost spent by districts found to be meeting standards could be used for all districts. 18. Why was this study needed? Michigan lacked a comprehensive school funding study and policymakers need a clear roadmap to make decisions about school funding in Michigan. Michigan currently ranks 24th in per-pupil K–12 spending, and ranked 8th-highest in per-pupil spending as recently as 2000. Since 2000, Michigan’s inflation-adjusted per-pupil spending has fallen by $663 per pupil, while the U.S. average has increased by over $1,400 per student. This report represents the most comprehensive school adequacy study in Michigan in at least 50 years. The report creates a new roadmap for best practices, student achievement and preparing all students for the future. Michigan now joins more than 30 states that have conducted comprehensive adequacy studies over the past 15 years as the first step toward improving student achievement for all students. 19. Who supports this study? All 56 Michigan Intermediate School Districts have passed resolutions of support, contributed financially to the project, or both. There is growing support across Michigan for a new school funding approach that improves student achievement and helps prepare all students for college and careers. This includes widespread support in the business community, which views a high-quality pre-K-12 education critical to Michigan’s ongoing economic comeback. 20. What does this study say about the cost of pre-K-12 in Michigan? The answer is not yet known. Additional work is needed to analyze the numbers and any additional funding beyond the base per-pupil cost. The purpose of this study was only to determine the true cost of educating all students to Michigan’s State Standards. 21. What are the next steps? This first-of-its-kind study will be provided to Michigan policymakers. It is now up to our leaders in the Legislature to take action on these recommendations. In the coming weeks, the School Finance Research Collaborative will make numerous presentations on the report across Michigan. To view the report, and stay up to date on the Collaborative’s work, visit fundmischools.org.